There are few passing game experts that have a better understanding of the intricacies of offensive football than Dan Gonzalez. Based near Dallas, Texas, Gonzalez has authored several cornerstone books in the coaching library. He remains on the cutting edge of the evolution of the passing game. As a consultant to numerous schools across the country, it’s his responsibility to scour all available resources to have answers in his arsenal. With the offseason kicking off, coaches are going to evaluate where their playbooks and philosophies stand. Dan is a great resource for these types of discussions. Question 1: What have been the biggest changes in your system over the last five years, whether it be big picture philosophy or new concepts featured? Navigation Tags are Gonzalez’s way of adjusting the quarterback’s reads and progressions based on what the defense is doing. This big picture adjustment allows the coach to give the quarterback a more defined scope on each play, rather than reading it the same way every time. His books explain the specific tags in greater detail. Question 2: How will you feature a speedy slot receiver in your system? The image below shows a specific example. Gonzalez uses the bunch formation to get a zone check from the defense. The bunch also creates a free release for his receivers. The “A” back is the speedy slot, running the “Beam” tag. The Beam tag is a seam read in Dan’s system. With four receivers lined up to the boundary, the nearest safety will have to cheat over. 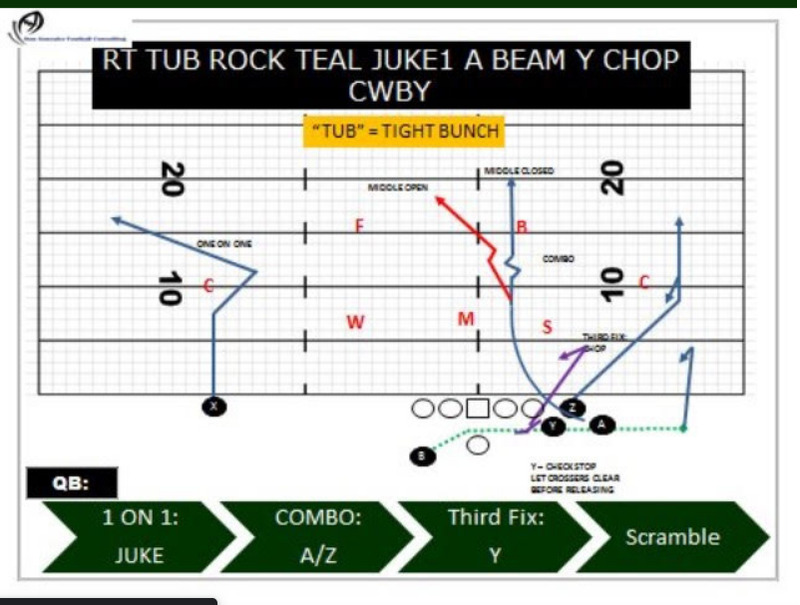 This will allow the “A” to have inside leverage for his post route against two high safeties. Against a single high safety that cheats over, the one-on-one matchup[GP1] to the field has a ton of space to work with. 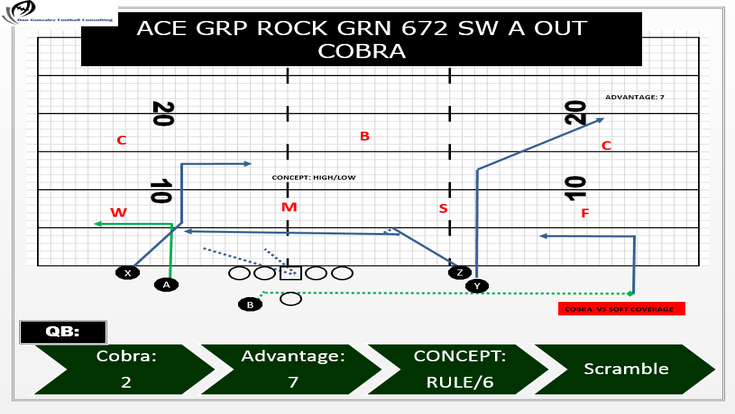 This route from the “X” receiver can be manipulated based on the tendencies of the defense that you are facing and the leverage of their corner. Question 3: How will you feature a big-bodied tight end in your system? Question 4: How do you approach pass calls on third and five differently than you would first and ten (big picture philosophy or specific play calls)? Simply put, the sequencing matters more than anything else on third downs. As the game progresses, Gonzalez sees value in using third downs as a way to break the tendencies an offense may have created earlier in the game.